This is one of the best contrasts you can come up with. No matter, if you go with white furniture or white walls, dark floors — wooden ones, especially — will give your room a sleek, memorable look. 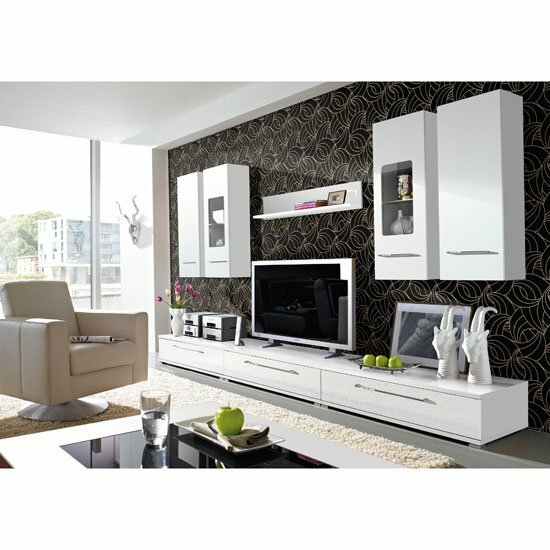 Another decorating idea for white living rooms that will make a bold statement in the interior. Plus, one bright wall (behind the TV, for example) will make the room seem a little larger and deeper. If one bright wall seems a little too much for you, you can as well paint a couple of black stripes in your doorway. Vertical black stripes will not only give your living room a sleek and contrasting look, they will also make it seem a bit higher. One of the best ways to decorate a living room and express your creativity at the same time would be to experiment with was murals. This idea is especially great for large rooms with minimum furniture. A bright sofa is another furniture unit that can make a bold statement in your room. Go for mono coloured upholstery and do not be afraid to explore some really bright shades. A chandelier is another decorative piece that can make a difference in any living room interior. If most of your living room is furnished in white, going with bright colourful chandelier can become a great contrasting idea. Going with a coffee table and a TV stand that would feature any other shade but white is another great idea — together, they will form a sweet matching pair, giving your living room interior a logical look. Follow FurnitureinFashion’s board 10 Decorating Ideas For White Living Rooms on Pinterest. If you are going for a mix of modern and classic, consider adding a couple of black furniture units into the room. The above-mentioned example of a TV stand and a coffee table can be a nice start. While looking for accessories, do not forget that large format canvases are some of the leading trends for 2016. Also, do not forget that furniture with colourful LED lighting can also become a bright accentuating means in your living room interior. Plus, there are some many different shades to choose from that anyone will find a hue to one’s liking. Those are some of the best decorating ideas for white living rooms, even though there is more. Here are a couple of other suggestions that might prove useful in the process.